Whats In My Junk Food? The big mac consists of two 1.6 oz (45.4 g) beef patties, special sauce which is actually a variant of Thousand Island dressing, iceberg lettuce, American cheese, pickles, and onions, served in a three-part sesame seed bun. it has a delicous flavour but is very high in calories and fat. i like the big mac because it is very delicous and is low in cost, making it easy to get with left over change. 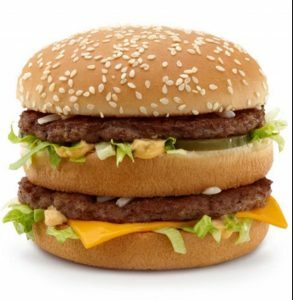 the big mac is very unhealthy because it has a high amount of calories (563) and high amounts of fat (33g) it is also not super filling which makes it so you want to eat more.